Brother Blue passed away earlier this month at age 88. 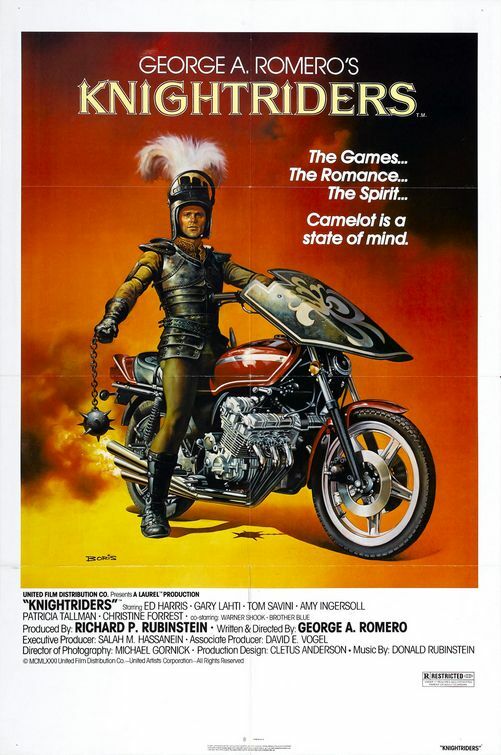 If you know of him at all, it’s probably from the George A. Romero film Knightriders. 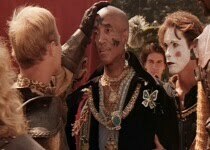 In this Arthurian story of jousting motorcyclists, Brother Blue played Merlin, advisor to King William (Ed Harris). He was the troubled king’s lone confidante, and the one person who understood William’s desire to maintain a chivalric code against the world’s materialistic temptations. If this blog post does nothing else, I hope it encourages you to seek out Knightriders for yourself. 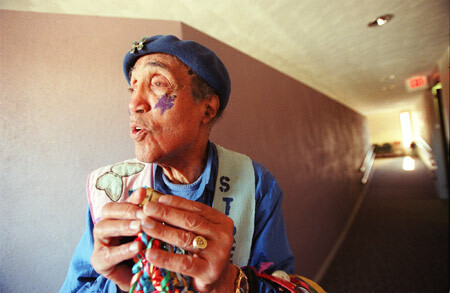 I met Brother Blue in 2001, as part of his main gig as a professional storyteller. The National Storytelling Festival, held every year in Jonesborough, Tennessee, attracts yarnspinners from all over the world and gives them a large, respectful forum for their talents. Brother Blue was not listed as an official participant, so when I saw his distinctive form–a bald African-American with butterflies painted on his face, in a blue robe and carrying a walking stick–I thought I was mistaken. But no, it was him, Brother Blue, Merlin from Knightriders. Eventually I worked up the nerve to say hello. He was tremendously gracious, and when I told him how much I loved the film, he said I reminded him of Romero. I thought he meant that, like Romero, I was a big guy with a beard. But he told me differently, and while I don’t feel comfortable sharing exactly what he did say, the memory of it is a treasure. But that wasn’t all. A week later, when I got ready to do the laundry from my trip, I found his card in a pocket. I know he didn’t give it to me; he must’ve slipped it there when I wasn’t looking. Or was it magic? To me it was. And is. And although I never saw Brother Blue again, I still feel as if I met Merlin. Brother Blue has been my mentor and friend for the last 20 years. Thanks for writing this. I'm glad you met him and felt his magic. Thanks, Laura. That means a lot coming from someone who knew him.